Substitute THRIVE Tomato Powder in any dish that calls for tomato paste or sauce. It's perfect for stews, soups, Italian sauces, casseroles or pasta. Easily create homemade spaghetti sauce or put together a steaming soup with tomato powder. 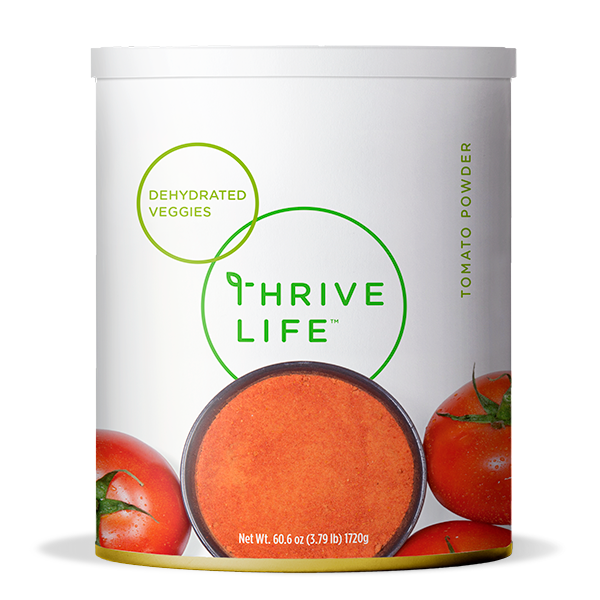 THRIVE Tomato Powder can be rehydrated with a ratio of 1 part powder to 4 parts water, though this ratio can be altered to reach desired consistency for various recipes. Add water to Tomato Powder to reach desired consistency for paste, sauce, or juice. Sprinkle tomato powder into tortillas with some Tomato Dices for a sun-dried tomato flavor. It’s easy to sprinkle into soup to add flavor, or mix it with your favorite herbs and use it as a rub for meats!